Fear not troubled sleepers, for I am here to save the night. I am specifically referring to the types who regularly admit, “I had a rough night of sleep” or, who are better defined as the snooze button-pressers; looking to get in those few extra minutes of sleep every day. You know, the unfortunate, sleepless bunch who continuously toss and turn throughout the night due to constant overheating—yes, I am directing this to your attention. Please allow me a moment of your time. I have done a favor for you. Yes, for you and you only, I have compiled a list of the ten best cooling pillows, to help you find the perfect sleeping aid that allows you to keep cool and sleep comfortably, the whole night through. Whether your budget is large or small, or whether you are a back, side or stomach-sleeper, this complete breakdown of products and features will help you select the pillow that is best for you. We all know that comfort is relative, so the order in which these pillows are ranked, is definitely interchangeable. However, this list of ten picks is arguably the best list available online, and you will not find it anywhere else. Each pillow has been judged according to its design features, care instructions, pricing, available sizes, overall ratings and customer feedback. Weighed by these standards, next they were put through a comparison against each other, then ranked accordingly. So, if you’re in the market for a cooling pillow, or shopping for a great gift for someone special, then you are in luck! The Good: Coming in at number ten, this reversible contoured gel and memory foam pillow is not only suitable for all kinds of sleepers, it is ideal for chronic neck and shoulder pain sufferers. Meet your new favorite sleeping companion. The CR sleep gel memory foam contour pillow is one of the leaders in its class. The magic lies in its cooling gel which disperses body heat ensuring you do not overheat. The contoured support is also built for a more comfortable sleeping experience. At last, you can finally catch some Z’s with this hot seller, and find out why so many other customers believe that this pillow is a must-have. The Bad: The sellers of this product have indicated that the fresh foam odor should dissipate 30 minutes after unpackaging and airing out. However, they also have stated that it should be stored in a cool dry area and away from direct sunlight, so you might want to hold off on taking this baby for a spin out on a beach, or camping. Additionally, the cover is washable but the foam insert can only be spot-cleaned with a damp cloth. The Good: Bamboo pillows are growing in popularity, and Plixio’s version of the cooling pillow proves why. 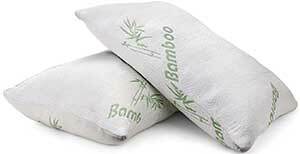 They are the makers of the bamboo cooling shredded foam pillow, that is designed using a cooling shredded foam technology that lasts all night. Discover what dreams may come in the perfect slumber night after night, with the help of this specialized pillow. The hypo-allergenic cover breathes, helping to keep the pillow dry and leave you in a meditative sleep. Resistant to dust mite, mildew and mold, this pillow is fabricated to provide layered protection, in order for you to cozy-up, and rest easy. 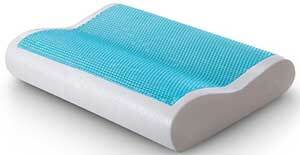 The shredded foam core not only cools, but relieves sleeping issues and chronic pain. Ah, yes. There is absolutely nothing more stimulating than waking up feeling rejuvenated after good night’s sleep, and this pillow does just the trick. The foam conforms to the shape of your head and body, promoting proper alignment. Conveniently made in standard, queen and king sizes, this pillow ships in packs of two, and to sweeten the already low-priced deal, each pillow is covered under warranty for two full years. The Bad: The pillow is non-adjustable, which basically means however firm or soft, you have to take it “as is” until it takes shape. Customer feedback had only a few complaints, those that did were all along the same lines of it being “too hard.” Thus, its unadjustability falls under the cons. Also, despite popular belief, the core is not machine washable. This pillow ranks highest amongst all pillows sold on the popular merchant’s website. And there is a very good reason for this. With a 233-thread count, cotton and polyester blend cover, these plush, luxurious pillows have it all: resistance to stains and fading, dust mite, mold, mildew, it’s hypo-allergenic and chemical-free. Sleep Restoration incorporates the “no shift” design in their gel fiber pillow for sound sleeping. No wonder the pillow does so well, it fuses the traditional pillow design, with the modern-day advancements—satisfying both worlds. Whether used for sleeping or decoration, they are available in king and queen sizes to fit your needs. These beauties are shipped to arrive two in a pack, for a low, convenient price. For this quality, the price is unbeatable. It is no surprise that this would pillow would be the top-seller because you get a lot more for your money. Buyers can purchase with confidence, as it comes with a 30-day guarantee or your money back. The Bad: Unfortunately, Sleep Restoration’s gusseted gel pillows are dry-clean only, and are not primarily manufactured for support. They are capable of keeping cool, however cooling is not the primary selling point for these pillows. This pillow would much rank higher on this list, if it was adjustable. The Good: The Weekender is primarily built for support and is superior to most pillows in its effort to relieve pressure. Take the night off from restless nights, and sleep like a royal on holiday. This low-cost cooling pillow option is a temperature-regulating gel pillow with a ventilation system designed to maximize air circulation. In other words, this pillow not only breathes with you while you sleep, but also comes with a sturdy 5-inch loft that works to keep you properly aligned; relieving you from joint pain and allowing you to get the type of rest you deserve. Do you find yourself consistently longing for that weekend recharge during the work week? Now, you can have it for every day of the week. The pillow cover is soft, removable and machine washable. The simple design accounts for its modest price, making it the popular, and most economical choice when selecting an effective cooling pillow. Adding to its list of features, the Weekender is CertiPUR-US® certified and backed by a 3-year warranty. I challenge you to find a more efficient, economically-priced item with the same offerings, that can out-perform this one. Good luck to you, as they are few and far between. The Bad: While the Weekender makes up in functionality where it lacks in style, the foam core material is not clearly defined, and does not allow for adjustments. The cover is a little thin, but that might be part of the design’s purpose. The Good: “They don’t make them like this anymore,” applies here, true indeed. This pillow stands as one of the only few cooling pillows on this list, that is a non-memory foam option. It is an updated take on a beloved classic — a remix, if you will. This 100% pure cotton, 240-thread count wonder is of the highest quality, crafted to bring elegance and relaxation directly to your bedroom. The stay-cool cover has sateen stripes 1 centimeter wide, adding the look of luxury to its features. The double-stitched hem provides a durable, flattening-resistant pillow, that retains its shape and loft, with a hypo-allergenic “3D Hollow” siliconized filling. Its mega-soft design prevents shifting and lumps, while working to keep you cool. Are the kids overheating at night, too? No problem. This pillow comes in toddler, standard, queen and king sizes for the entire family to stay cool. The affordable price of this two-pack bargain, along with its easy care “wash in cold water” instructions, adds to the overall value of this pillow. You will not find too many pillows on this list that are completely machine washable, however Mellanni’s plush gel-fiber filled pillows are one of those too few options. So, you say you don’t want feather-down or that you are not a big fan of foam; all because you are hyper-sensitive to smell. You also say, you have trouble keeping cool at night. Okay, then this my friend, is your pillow. Go ahead and click, “add to the cart,” because it does not get any better than this. Oh, and another good thing is in the rare case that this pillow is not what you are looking for, a full refund is offered by the manufacturer, who offers a lifetime guarantee! Absolutely splendid. Any product backed with a lifetime guarantee, not only speaks to the manufacturer’s confidence, it pretty much sells itself. The Bad: With the world moving closer and closer to eco-friendlier, environmentally-safer products, the synthetic filling may serve as a slight disadvantage in this pillow’s case. 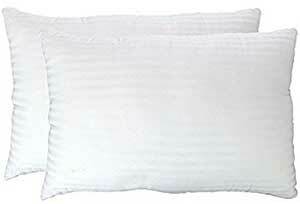 While its foamy competitors offer stuffing to adjust the degree of softness or firmness, this pillow does not. Also, unlike its counterparts, the cooling feature is not the primary function of this pillow. The Good: Do you want a futuristic cooling pillow that was created to cater to your sleeping needs? Try this one on for size. 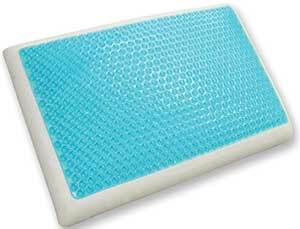 This naturally hypo-allergenic pillow redefines “the cool side of the pillow” with a cool gel side feature that creates a cooling sensation while you sleep. Imagine that, a pillow with its very own version of air-conditioning. Hot flashes, be gone! No more waking up to sweat stains on your pillow. It also has the latest developments in technology with open cell memory foam, which is more porous, and more breathable than conventional foam. Look out world, here comes Classic Brands, and with them: the future of memory foam. If you are looking for technological advancements in sleep aid support, look no further. For a reasonable price, this product offers multiple ways to ensure a nightly, uninterrupted snooze fest of the champions. The reversible cool gel and memory foam pillow is designed to cradle the sleeper, and help regulate the body’s climate. It responds to temperature and pressure, and molds to your shape for ultimate cervical support. You say you are looking for a cooling pillow with a lot more to offer? We have got you covered; as does the manufacturer with a worry-free, 3-year warranty. The Bad: This pillow only comes in the Standard size, and only the casing is machine washable. The Good: TruContour thought of everything. The company’s name clearly defines their mission, and when you encounter their firm cooling gel memory foam, you will see why TrueContour is not only who they are, it’s what they make. Read it, and sleep: “Dual-sided with cooling gel and medical-grade memory foam.” That just about says it all. Whether it is for those long, hot summer nights, or cold winter days, this pillow answers the call of duty. Not only is this a multi-purpose product, but buyers have the option of choosing their degree of support, available in soft or firm medical-grade memory foam. Not all sleepers are alike, and as customers, we feel that the more options available to us, the better. Fortunately, the manufacturer of this product, understands that. Buyers can capitalize on their spending, by exercising their buying options with this cooling pillow that quite frankly, does it all. The three fabric design has innovative features such as a blue, micro mesh gel side for cold transfer. Feeling a little heated? No problem. Flip the pillow with the blue side up, and let it go to work for you. The true cooling gel matrix layer transfers heat away from the body. On the flip side, the honeycomb mesh fabric for the memory foam side is built for comfort and breathability. Which ever side you choose, this pillow is sure to fit you, and you will be tucked into bed nice, and snug. The grey gusseted cover is not only washable, it is a 360-degree seal protecting you and the foam core, while promoting air flow. As an added bonus, the pillow comes with a 100% guarantee and 1-year warranty. The Bad: A pillow case is not included with purchase, but it is recommended. Because it is built primarily for its supportive function, and not for style or decoration, it comes in Standard/Queen size only. The Good: Urban Bloom presents their elegant, yet comfortable version of the cooling pillow. The first things you notice about The Domus Pillow is that it is very attractive, stylish and there is no mistaking how comfortable it truly is. There is no denying its appeal, as it is crafted with only the finest materials. Its contour foam core is a lofty 5-inches thick, offering minimal flattening, and support consistency. This pillow will outlast most others, and it has my vote for “most likely to be the pillow to fight over in your home,” hands down. If you are partial to soft, durable pillows, then congratulations! We have found a perfect match for you. The interchangeable foam is engineered with hundreds of air holes for ventilation, aiding in the effort to keep you cool and comfortable all night long. 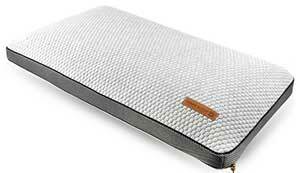 The premium, tufted-knit “Lux Loft” cover is machine washable, and built with cooling and comfort as the ultimate goal. Reminiscent of your favorite t-shirt, the pillow is remarkably soft because of its cover; a knitted and stitched fabric in a quilted, hexagonal design that is perfect for airflow, and promotes a cool surface for all heads to lay rest. The gusseted perimeter is made of an air-releasing mesh, allowing heat to disperse through the air pockets, for optimized cooling. This pillow is built to last, and the manufacturer’s unbeatable 10-year warranty, is proof-positive that The Domus Pillow is here to stay. The Bad: Unfortunately, The Domus Pillow is only available in Queen size. Although the cover is machine washable, the core would have to be spot-cleaned. The zipper has their signature leather strip as a pull-tab, which may be irritable to some, but it will not count as a strike against them since it is removable. 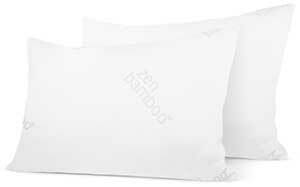 The Good: Zen Bamboo offers a high-quality, eco-friendly take on the cooling pillow that does not disappoint. This pillow undoubtedly brings the Zen, and now you can make every day, a spa day. Have you ever wanted the feeling of being at a hotel and resort, without the hassle of leaving your home and forking out the big bucks? Well, ladies and gentlemen, here it is, the ultra plush gel pillow. A soft, supple cooling pillow that you can really sink your dreams into. It is “Ultra Plush,” true indeed. It looks, and sleeps, like a cloud puff. A fresh, soft, clean appeal that is as equally as gentle as the sleeper it comforts. Upon sight, you are moved to take a time-out from the rest of the world, and wrap yourself around its fluffiness. This premium gel fiber pillow is anti-microbial and hypo-allergenic; tailored with an expertise on how to maximize comfort for every sleeping position. The cover is made from a chemical-free jacquard bamboo, providing a breathable, soft surface. Not only is it completely machine washable, but it’s also fade and stain resistant—craftfully engineered to stay looking new. The “no-shift construction” gel fiber, means that you can look forward to a good night’s rest each and every time you are looking to get peaceful, pleasant shut-eye. Simply put, this cooling pillow is tough to beat. The Bad: Although the ultra plush gel pillows by Zen Bamboo come in a pack of two, they are only available in Queen size only. The level of neck, back, and shoulder support; or lack thereof, was not a determining factor in the rank of this pillow, because there was no indication in the product’s description. However, its main features by which the product was judged, far-outweighed the need for the supportive function. Most cooling pillow manufacturers offer a warranty as well, but Zen Bamboo only offers a 30-day full refund guarantee. The Good: Folks, we have a winner! The Eden, in all its glory. Rest assured, pun intended, that this reigning champion puts all other contenders to shame. No other cooling pillow tops this one. The people over at Coop Home Goods have it all figured out. You can shake this list up a thousand times, and this pillow will fall into the number one slot-position, every time. With their completely washable pillow (both covers and foam fill), Coop Home Goods has managed to build a pillow to accommodate the masses. Sleepers are kept cool by its mildew, mold and dust mite resistant, hypo-allergenic, signature LULLTRA™ fabric, a blend of viscose rayon and polyester blend derived from bamboo. Its thick, quilted-design cover adds to the overall durability and coziness of this cooling pillow, raising the bar and knocking the competition out cold. The seam of the cover is a gusseted breathable design that has “invisible” zippers to prevent nightly irritation. The inner cover has an invisible “guarded” zipper, keeping the safe CertiPUR-US® certified foam fill tucked neatly inside, to prevent snagging when adding or removing fill. By the way, the pillow is adjustable, so additional gel-infused foam fill is available for those requiring more support. If all of that wasn’t enough, the Eden comes in Standard, Queen and King sizes so whatever your bed size or preference, get ready to be amazed by all it has to offer. This pillow may fall on the pricey side, but you get what you pay for and in this case, your money would be very well-spent. If it is within your budget, add it to your shopping cart, change the quantity to “2,” check out and send the extra one to me! The Eden is made proudly in the USA, and backed by a 30-day guarantee, as well as a 5-year warranty. What more could you ask for out of a pillow? I strongly believe that if there is more that you want, we can trust that the team over at Coop Home Goods will deliver. The Bad: The price tag of the pillow may be cause for concern, which is expected when paying for high-quality products. When newly unpackaged, the pillow may require an airing-out period of approximately 48 hours before the smell dissipates. It goes without saying that cooling pillows have a variety of medical benefits apart from ensuring you get a good nights sleep. Night sweats are the most common reason for getting a cooling pillow. Night sweats can be caused by high room temperature (duh! ), menopause, medications and hormone disorders to name but a few. You run “hot”. Some people simply feel the need to cool down more often then others. You know those people who wear shirts during winter? Chances are a cooling pillow is a good option for them. Issues falling asleep or insomnia. Now of course, I’m not saying that a cooling pillow will cure you of all your sleeping issues, but it will help. A lot of restlessness is to do with the fact that your body is hot. Cooling it down will help you remain still and eventually (hopefully!) fall asleep. Another reason for purchasing a cooling pillow is simply that you wish to try one. After all, science has shown a lower body temperature is associated with a better sleep, so even if you don’t suffer from any of the problems mentioned, you may find yourself sleeping that bit easier with a cooling pillow. What are cooling pillows made of? It’s always good to have a bit of technical information before deciding which cooling pillow is right for you. As you know, cooling pillows are made from a variety of materials so I’ve decided to include this nifty table that shows you the benefits and disadvantages of each one. You can see that certain materials are naturally better at some things then others. However; manufacturers have become very clever these days and have made pillows that are good at all the things you would expect – cooling, adjustability and support. But what exactly do these terms mean? When it comes to cooling pillows, the ‘cooling’ ability is clearly the most important component. After all, no one likes a hot and stuffy pillow to sleep on! The inside material of the pillow is the all important determining factor. A popular choice is some type of gel which effectively transfers the heat from your body. The pillow cover material is also a very important consideration. Generally, the more breathable it is, the better for cooling purposes. Hence; you’ll find many cooling pillows adopt a bamboo-based cover due to it exceptional breathability and softness. In fact, our top two pillow picks have a bamboo cover. 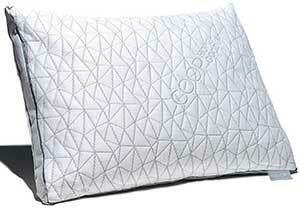 This refers to the pillows ability to be shaped or changed to support your sleeping. For example, if you like to lie on your back, you want your neck to be in a neutral position – neither too forward or too back. An adjustable pillow will allow you to remove the inner material so you can adjust how thick it is and therefore get that perfect fit. Some pillows will have several cushions inside that you can remove. This is a bit similar to adjustability, but when we talk about support we are referring more to a pillows ability to actually change its shape according to your head and neck. Memory foam is a very popular choice and it works by becoming softer when exposed to heat, which in this case is your body. Effectively your head will create a groove in the pillow. It’s the tricky goal of pillow makers to figure out the perfect firmness to provide the right amount of comfort and support. If you sleep on you side: Foam is a good choice since it is firm enough to support your spine. If you sleep on your stomach: A synthetic or fiber based pillow is a good choice since it’ll provide enough support without angling your head too much. If you sleep on your back: Again, foam is firm enough to provide enough elevation. This is just a general guide. You’ll find all of our best pillow picks to be suitable for all sleeping styles, especially since many of them can be adjustable and are designed for head and neck support. Furthermore; many of them contain a mixture of gel (for cooling) and memory foam (for support), so you get the best of both worlds! Amongst all household items, a pillow is probably close to the top of the list of ‘items that need to be regularly cleaned’. This is where reading the manufacturers instructions are of up-most importance – the pillow may be machine-washable or hand-washable depending on the materials. Tip: You’ll typically find most pillow cases are machine washable whilst the inner contents will need to be hand-washed. It’s also good idea to fluff you pillow daily to help remove any build up of dust mites and other little nasty surprises. 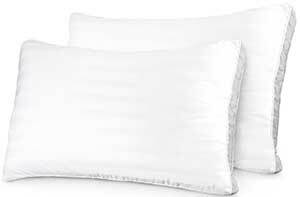 There are some of us out there who demand a pillow that is free from dust mites and allergens. In comes the hypo-allergenic cooling pillow. But what does this actually mean? So basically, if you suffer from allergic reactions from anything to do with your bed, such as itching, eczema or swelling, your best bet is to get a cooling pillow that is hypo-allergenic. Luckily all the cooling pillows we’ve mentioned have this property, although some manufacturers use the term “allergen-resistant” instead. Another factor to consider is a pillows anti-microbial properties which help deal with issues like dust mites, mildew and mold. Both hypo-allergenic and microbe resistant properties go hand in hand and you’ll find that most of our best picks sport both functions. I hope you found our best cooling pillows countdown and buyer’s guide to be informative, entertaining but most of all, helpful. I enjoyed producing this article and learned a lot of things for myself. Like the painful reminder of how important it is to get a quality night’s rest. How the amount of sleep you get can directly impact your day. These things may seem minutia on a broader scale, but it does effect our personal well-being. We might be experiencing an entirely different world if everyone, literally everyone, experienced a meditative, comfortable and proper, full night’s rest. Unrealistic as that may be, still, it brings a sense of peace just imagining that possibility, doesn’t it? I say, we start the movement one cooling pillow at a time. Who’s first? Have you already made a choice? Whichever route you decide to take dear sleeper, be sure to read the pillow’s care instructions and product tags in order to get the most out of your cooling pillow experience. Though some may dismiss the information as merely a suggestion, be advised that instructions are included for a reason, so if you want to get more bang for your buck, take heed. Don’t destroy your investment or lessen your experience by ignoring the rules. Remember, these products were all made to aid you with your sleeping issues, and the makers are confident in their product. In the meantime, be sure to let us know your final selection and leave a product review in the comment section below. Until then, I bid you “good night,” Sleepy One.